Chile con queso (Spanish for "chile with cheese"), usually known simply as queso, is an appetizer or side dish of melted cheese and chile pepper typically served in Tex-Mex restaurants. Chile con queso (also spelled chili con queso) is a part of Tex-Mex and Southwestern cuisine, originating in Texas as a version of Queso chihuahua and Queso flameado from Northern Mexico. Chile con queso is predominantly found on the menus in Tex-Mex restaurants across Texas. However, authentic Texan-style chile con queso has been mentioned since at least the 1950s in newspaper articles from states such as California and has appeared on restaurant menus in Washington, DC. Chile con queso is a smooth, creamy sauce, used for dipping, that is made from a blend of melted cheeses (often Velveeta, Monterrey Jack or cream cheese), cream, and chili peppers. Many restaurants serve chile con queso with such added ingredients as pico de gallo, black beans, guacamole, and ground beef or pork. In skillet, heat oil over medium heat. Add ground beef, onions and beer, stir well. Cook until no longer pink. Add refried beans, stir. Add taco seasoning, diced tomatoes with chilies, salsa con queso. Stir well. Preheat oven to 350 degrees. 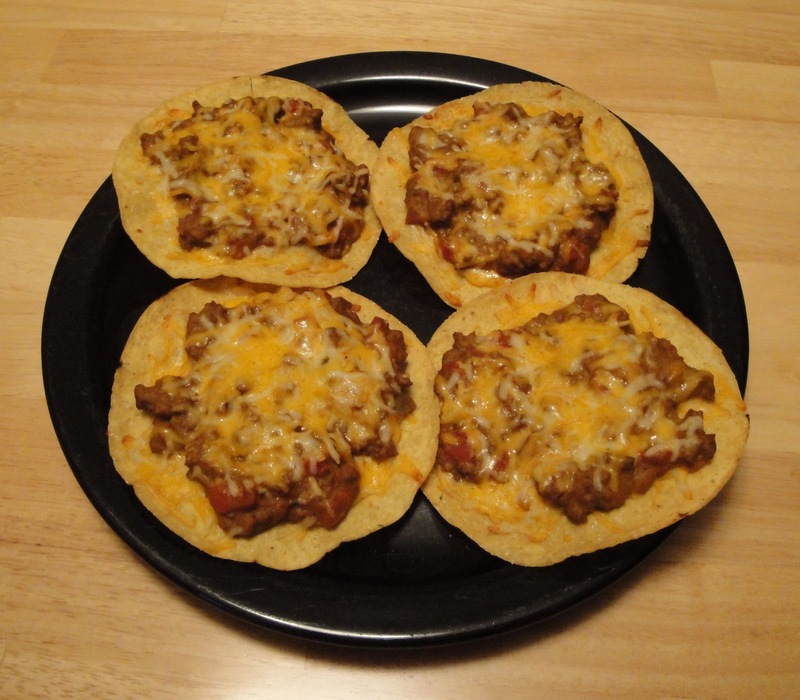 On large sheet pan, place corn tostadas, sprinkle cheese, then add spoon full of meat mixture, add additional cheese over top of meat mixture. Place in oven, until cheese is melted. Enjoy! mmm, Christine, simple , yet delicious! Wonderful! Happy Holidays! OMG these look so good! Can't wait to try them. Thank you Leahsthoughts. I hope you enjoy! Looks great Christine! I'll try it with tofu. Thanks for the idea! Ooh, that looks satisfying--I have been craving Mexican food today! Looks delicious:))) I wish you happy holidays!